Following on from the previous post (same but different) ... this time with Clustered ONTAP! In the post, we run through the steps to setup a Clustered ONTAP SnapMirror-ed Production and DR setup, additionally with a SnapVault of the production volumes at the local site, and further mirror the volume with the SnapVaults to a DR site. In the lab I have two sites with the below named Clustered ONTAP systems and Storage Virtual Machines. We will create 3 volumes on the Production SVM (NASVM1) that we want to protect. Note 1: The version of Clustered Data ONTAP used in the lab is 8.2.1. Note 2: SVMs are already setup and Protocol Licenses applied. Here we add licenses for SnapMirror and SnapVault (Primary or Secondary) as required. Intercluster LIFs are created for Cluster to Cluster communication. Note: If these Intercluster LIFs weren’t all on the same subnet, you’d need to create a route/default gateway by using the command “net ro ro create”. The Cluster and then Vserver (SVM), need to be peered as per requirements. 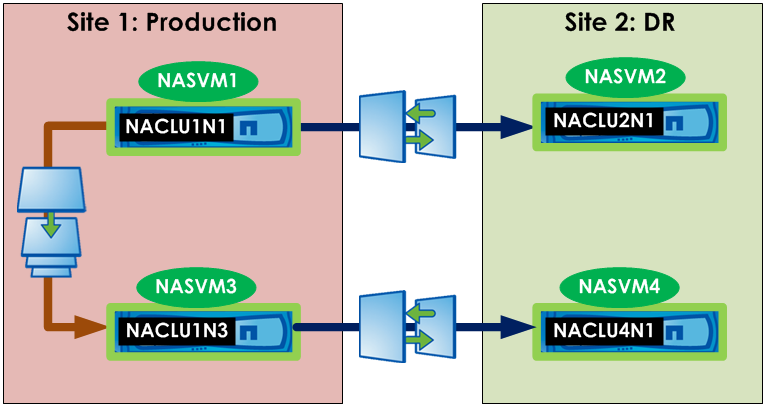 The SnapVaults run from NACLU1/NASVM1 -> NACLU3/NASVM3.